DOES REPLACING YOUR WINDOWS ADD VALUE TO YOUR HOME? Brock Doors & Windows Ltd. DOES REPLACING YOUR WINDOWS ADD VALUE TO YOUR HOME? To answer frankly: yes. Yes, replacing your windows does raise your home’s value. Think about this: residents looking for their new homes in Brampton, ON, area are looking for sleek, quality windows for many reasons. So, if the three-year plan for your home includes selling, you want to pay attention to what the buyer wants. That said, replacement windows through Brock Doors and Windows will help your house stand out in the neighborhood and raise your price-point by thousands. Our team wants homeowners to understand the benefits to you and to your future buyers when you choose to upgrade your home’s value with replacement windows, so we have created this short guide with you in mind! What is the most significant benefit of replacement windows through Brock? Honestly, the most significant benefit is in the eye of the “home-buying beholder.” Some are looking for style, some are searching for extra natural light in every room, and some are looking simply to avoid the expense of replacing anything in the near future. All home buyers are looking for quality windows. Luckily, at Brock, quality is what you’ll get! We select only the best manufacturers to ensure we are providing you the best. Within our team, you will find a group of experts who specialize in windows and doors installation, held to the highest standards. Above, we mention lowered monthly heat/air conditioning bills. This happens because new windows create a tighter seal, protecting your home from energy loss and wasted conditioned air. In fact, air leaks are one of the leading causes of wasted energy in our homes—blocking leaks means you will spend less to keep your home comfortable for all. Further, and this may surprise you (as we have discovered many clients are unaware of this), home heating and cooling costs account for more than 40% of the average homeowner’s yearly energy budget! That’s a lot. Why is this number so high? This is because so many homeowners have poorly functioning, cheaply manufactured, or outdated and worn windows. We have proudly been in business for decades, and it shows; our customer base is extensive and widespread and our products and workmanship are top-of-the-line. Book a free, no-pressure consultation with us and we will go over samples together, take measurements throughout your home, provide answers to your important questions, and generate a quote for you. 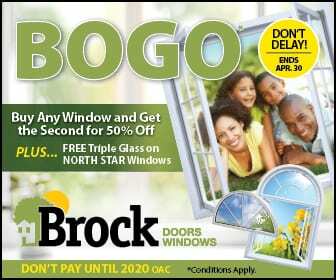 Your Brampton, ON windows replacement project through Brock Doors and Windows is just a phone call away!